Jack & Phillip have both been SO close to learning how to swim on their own this summer but we took a small hiatus from the pools when we had some vacations and a lot going on. Last week I realized summer is coming to an end (honestly...finally!!) and I really, really want them to be swimming on their own before summer is over so we don't have to start all over again next summer! So we've been going to Grandma Wallace's every day after Jack gets out of school and I've been doing 20 min each with Phillip & Jack. If Zoe isn't napping she gets in too (with her puddle jumper). They honestly are SO close but still not quite there. Jack can swim without any flotation assistance from me to the wall and then back (stops at the wall to catch his breath) when I'm standing about 8-10 feet back. Phillip does so good when he is wearing his little turtle shell swimmer assistant (not pictured). Let's talk about the swim trainer for a hot minute. NOT SPONSORED. You can pretty much safely assume that nothing I talk about is sponsored. Not that cool, guys haha. Anyway, it is THE BEST thing ever!!! 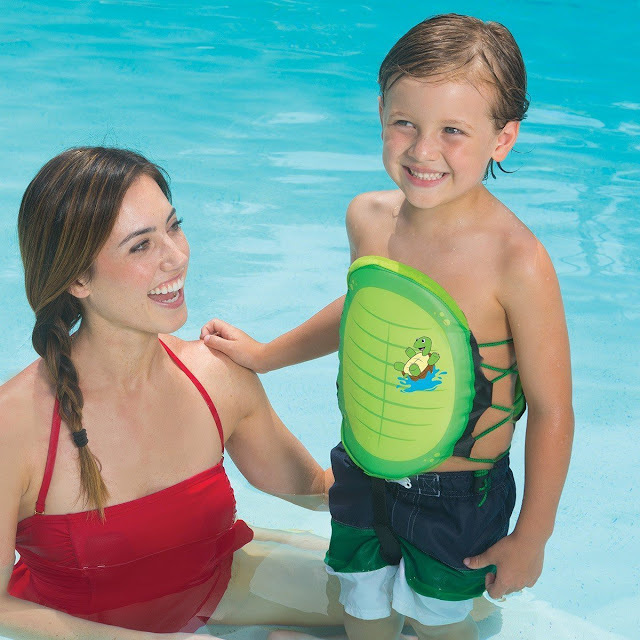 Next summer, I'm foregoing all swimming lessons (we paid for a few for the boys at the beginning of summer) and just using this little turtle shell because honestly it teaches them how to swim! FYI it is a swim TRAINER, not a flotation device. It's completely different than a puddle jumper or life vest so don't think you are going to replace that with this. While the puddle jumpers still require constant supervision, this swim trainer requires even more. Like they can still sink. It isn't going to flip them to their back or anything if they are in distress. It's a swim trainer and it works when it's used for what it's meant for. There are like 10 foam inserts each in the front and back of the trainer and they are removable. As your child becomes more comfortable swimming with the trainer, you remove one insert at a time (alternating front and back) as they become more and more comfortable. Be careful not to over-challenge them. Wait until they are comfortable with the current "setting" until you change it again. Phillip now swims with about 6 each in the front and back. For reference, we ordered a size medium and it fits Phillip perfectly (he's 3.5 and 30lb). It fits Jack fine but is maybe a little tighter than it's supposed to be. Although I could loosen the sides a bit and that would probably help. I haven't tried it on Zoe yet but I imagine it would fit her too as long as I tightened the sides (she is 2 and about 25lb).